We hadn’t considered giving ten percent of our mint to St. Benedict, but that might be a good idea. We have a lot of mint. Late this spring, I decided to embark on a cooking project to make as many things with mint as I could. 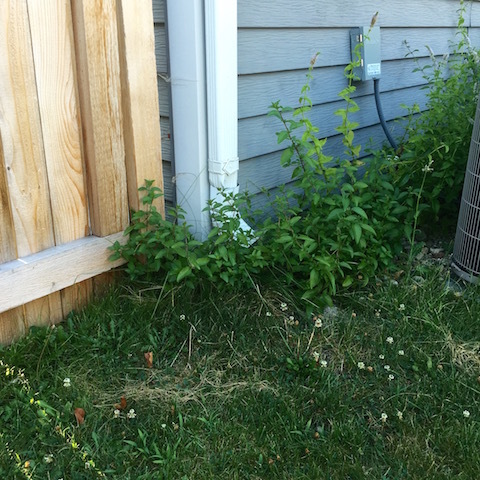 As you can see in the photo below, it’s now mounted a line of attack behind the air conditioner, under the gate, and out into the wide world. I could yank it out, but I’m a busy lady. Besides, I’d rather eat it. But I’ve had to give up on trying to harvest and consume enough to keep it at bay. First of all, Adam will only accept so many mint-flavored items as part of his weekly diet. 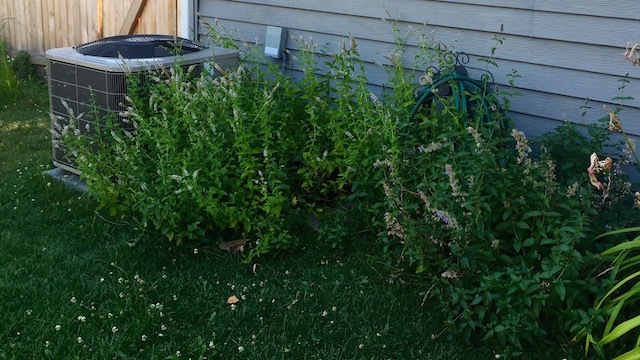 Secondly, harvesting mint only makes it grow back thicker. Mint is like growing older – you can try to outrun it, but it will always win. At least when I have to step through it to turn on the hose, I get to enjoy the smell of the damp, cool, pungency of the stuff. And I’ve discovered so many ways to enjoy it’s fresh taste that I’m glad I can have as much as I want for free. Here is a third round of recipes, the ones we’ve liked most this summer. For an introduction and first round in late spring, look here. For the second round, over Memorial Day, read here. But seriously, this last round are far and above the best – practice makes perfect. Much more refreshing (and fun!) than dried mint in a teabag. Optional additions: a thin slice of fresh ginger, a few leaves of basil, a spoonful of honey, a lemon slice or two, a little sprig of fresh rosemary. 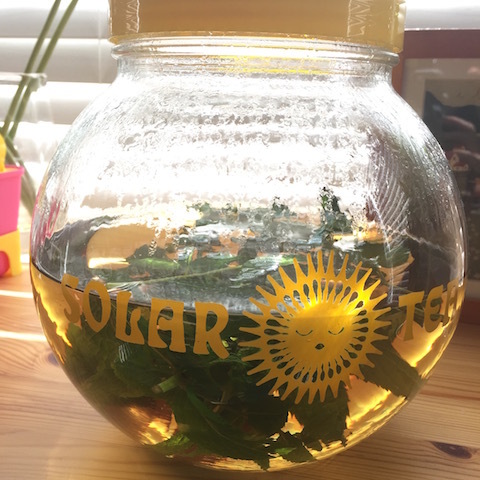 Arrange the mint in a teapot, a glass pitcher, or a heat-proof bowl. It’s okay to cut it to fit, if necessary. Include one or two of the optional additions, if you like. Bring water to a rolling boil, then pour over the mint. 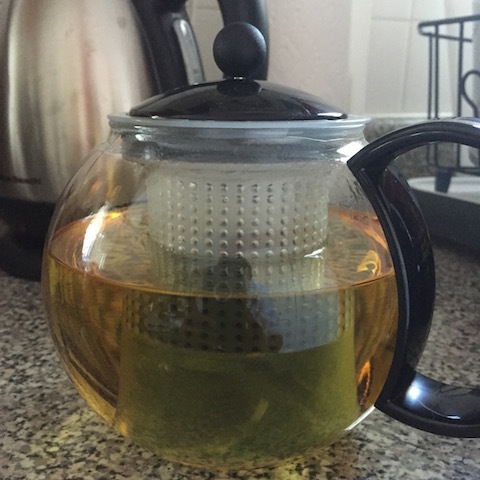 Let steep for 3-5 minutes, or maybe even longer. Pour into a teacup. If you want to ice it, steep it longer so it won’t be diluted by ice cubes. Then pour into a heat-safe container or pitcher and set out to come to room temperature or chill in the refrigerator. Mix with club soda, LaCroix, or lemonade, if desired. Adapted from the Moosewood Cookbook. Since tomatoes in tabbouleh always seem to wilt, I prefer to leave them out. Also, cucumbers are IN THE BIBLE, but tomatoes wouldn’t make an appearance until after they were brought over from South America in the 16th century… so this is closer to what Jesus would’ve eaten. Combine bulgur and boiling water in a small bowl. Cover with a plate and let stand for 20-30 minutes at least, so bulgur is tender. 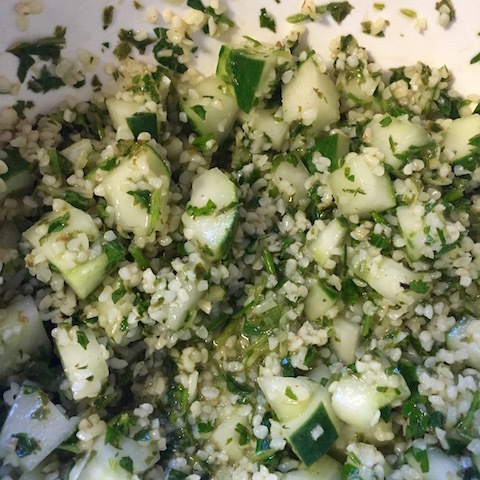 Mix bulgur, herbs, and cucumber, then add dressing to taste. 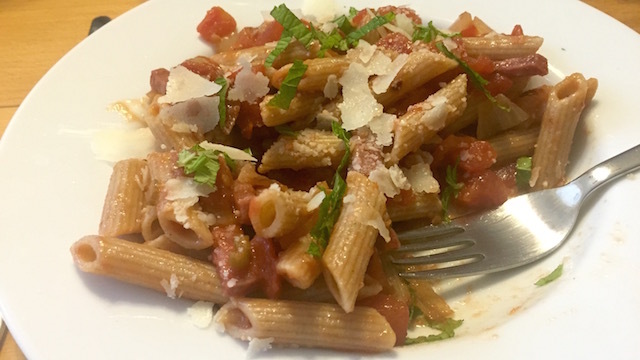 The whole wheat pasta is heavy and hearty enough to stand up to the strong flavors. Mint is great with strong tasting meats, actually – I haven’t made mint jelly, but that’s perfect for lamb. To make the tomato sauce, heat the oil in a medium saucepan over medium-low heat. Add the onion, garlic, salt, and a small pinch of black pepper. Cook, covered, until the vegetables are very soft, 5 to 7 minutes. Pour in the tomatoes and their liquid. Continue to simmer until the sauce thickens and the oil separates and rises to the surface of the sauce, about 25 minutes. Season with salt and pepper, as desired. To make the pasta, bring a large pot of heavily salted water to a boil. Cook the pasta according to the package directions, then drain. Cut the salami into batons about 2 inches long and 1/4 inch thick. In a large, straight-sided skillet, heat the oil over medium-high heat. Add the salami and cook, stirring occasionally, until the sausage is light golden and has rendered some of its fat. Pour in the tomato sauce and red pepper flakes. Cook over high heat until the sauce looks dry and turns golden around the edges, about 8 minutes. Add the pasta. Divide the pasta among individual serving plates. Sprinkle each serving with mint. 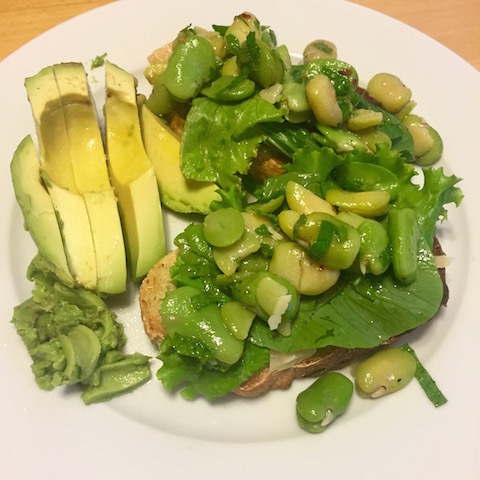 The movie “Silence of the Lambs” may have ruined fava beans for many people, but they are wonderful. 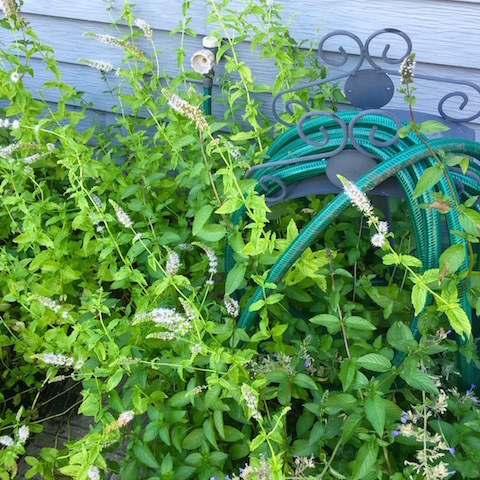 I had fun growing a patch this spring and happened upon a recipe that mixed them with mint — how could I resist? You can make fun of Martha Stewart but her recipes never let me down. Toss cooked fava beans with extra-virgin olive oil, fresh lemon juice, and a few chopped mint leaves. Season with coarse salt, freshly ground pepper, and a pinch of crushed red-pepper flakes. Spoon onto toasts. Top with grated Pecorino Romano or Parmesan cheese. Susie, a seminary friend, posted this recipe in a single sentence on my Facebook page. Her review: “Super super easy and good.” And it is. I’ve given a few measurements as a guide but feel free to play around – it would be pretty hard to make this taste bad. 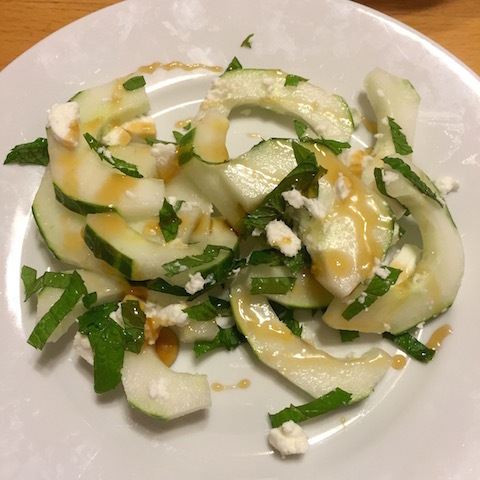 Place cucumber in a bowl and top with feta and mint. Drizzle with as much honey as looks good to you. Amazingly good, if you don’t mind the punch of a little raw garlic. Preheat the broiler. 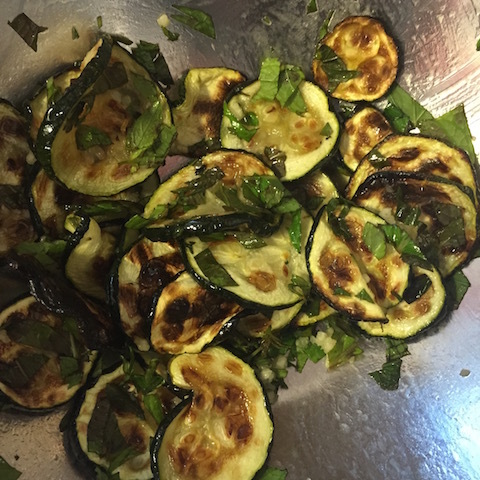 In a bowl, toss the zucchini with the oil and salt. Arrange the slices in an even layer on a baking sheet. Broil about 5 minutes, or until the slices begin to brown. Flip with a spatula, and broil 5 minutes more. Take out of the oven and put in a bowl with the garlic and mint. Toss gently and taste, adding more oil or salt, if desired. 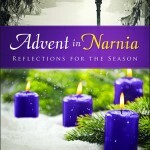 This is freaking amazing. It’s not simple, but the texture of this ice cream is worth it – and you don’t have to use a million egg yolks, so it’s got less cholesterol, too. I used 5-6 long stems of mint. Don’t worry about the corn syrup – it’s not as sweet or evil as”high fructose” corn syrup. But it can’t be replaced with other liquid sweeteners (honey, agave, maple syrup) because it’s uniquely able to prevent ice crystals from forming as the ice cream freezes, which is essential to this ice cream’s texture (and in part why you don’t need egg yolks – cornstarch and cream cheese help too). Mix about 2 tablespoons of the milk with the cornstarch in a small bowl to make a smooth slurry. Whisk the cream cheese and salt in a medium bowl until smooth. Fill a large bowl with ice and water. Combine the remaining milk, the cream, the sugar, and the corn syrup in a 4-quart saucepan. Bring to a rolling boil over medium-high heat, and boil for 4 minutes. Remove from the heat, and gradually whisk in the cornstarch slurry. Bring the mixture back to a boil over medium-high heat, and cook, stirring with a heatproof spatula, until slightly thickened, about 1 minute. Remove from the heat. Gradually whisk the hot milk mixture into the cream cheese until smooth. Add the mint. Pour the mixture into a 1-gallon Ziploc freezer bag, and submerge the sealed bag in the ice bath. Let stand, adding more ice as necessary, until cold, about 30 minutes. Refrigerate to steep for 4 to 12 hours. 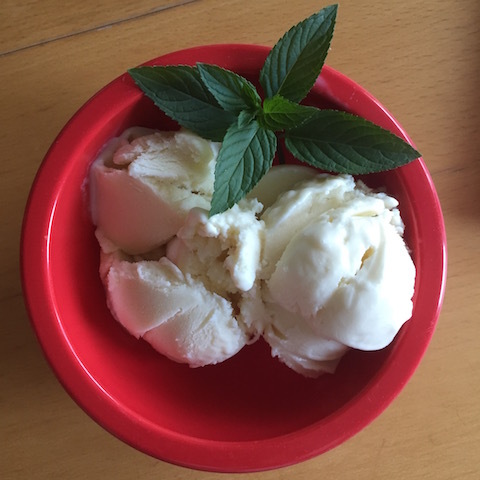 Strain out the mint, or fish out as much as you can with a fork or spoon (it’s kind of fun to find little bits of mint leaves in your ice cream). Pour the ice cream base into the frozen canister of your ice cream maker, and spin until it’s thick and creamy. Pack the ice cream into a storage container, press a sheet of parchment directly against the surface, and seal with an airtight lid. Freeze in the coldest part of your freezer until firm, at least 4 hours. Serve and swoon! These recipes look absolutely delicious! Thank you!